Well it’s generally around the braai that stories are told but when most of the cars that are parked outside are 4×4’s then the conversation turns to off-roading,trips and equipment.On the last occasion I asked the group to give me a list of essential items and I was rather surprised when a first aid kit was left out and a Hi-Lift jack was almost the most important piece of equipment on everybodies list.When I looked at the vehicles half of them never had suitable jacking points. Then to the recovery bag we added a tyre pressure gauge of the type that can also be used to deflate tyres. Fires happen so we added in a suitably sized fire extinguisher which was to be kept in a readily accessible spot( with the first aid kit they forgot). 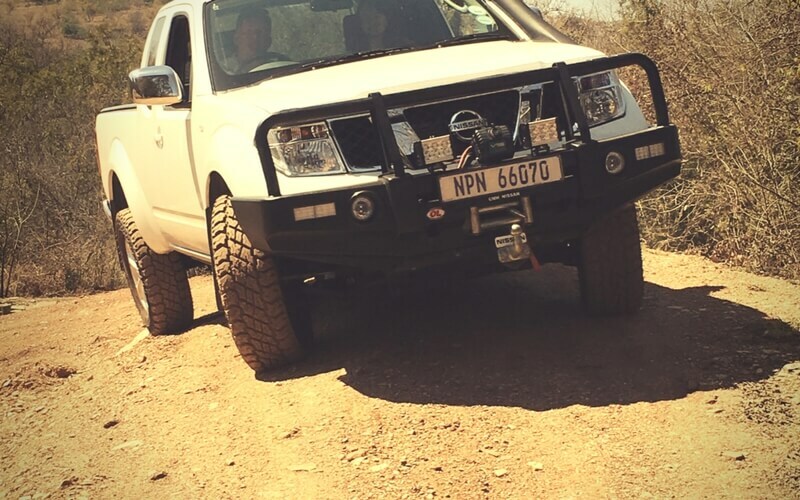 Then there was the obligatory bull bar and spots,a must have if you want to fit a winch and useful protection in dense bush,although we do not advocate driving after dark sometimes it just happens and the lights are useful. Then we added in a folding shovel,useful around the camp and small enough to get under a vehicle stuck in mud.Can also be used to move coals and dig a cat latrine. Then we had Jerry cans which had to have a TUV/DOT certification and be correctly coloured for Petrol and Diesel. A good small axe came up next,always usefull around the camp but also helpful for clearing operations along the trail,get one with a flat head which can also be used as an emergency hammer. Lastly up came the GPS , generically referred to as the “Garmin” with the aged 276c and the Montana being the unit of choice, add to the Tracks for Africa ( T4A) as the backup to Garmins maps.